In his novel A Thousand Splendid Suns, author Khaled Hosseini provides a vivid portrait of a country shattered by a series of ideological leaders and wars imposed on it by foreign and internal forces. The narrative, which spans several decades, is driven by the stories of two women, Laila and Mariam, who, despite starkly different beginnings, find themselves intimately connected and dependent upon one another. Hosseini’s women, much like the country of Afghanistan itself, appear to be propelled by the whims of outside forces, familial and societal, with little chance of influencing their own lives and futures Yet Laila and Mariam are neither passive nor helpless as they make choices and accept consequences to affect desired ends, both hopeful and tragic. In interviews and talks, Hosseini claims to write simple love stories, but his portrayal of Laila and Mariam and their dreams, trials, and challenges presents a complex view of women in Afghanistan that goes beyond oppression and the stereotype of the veil. 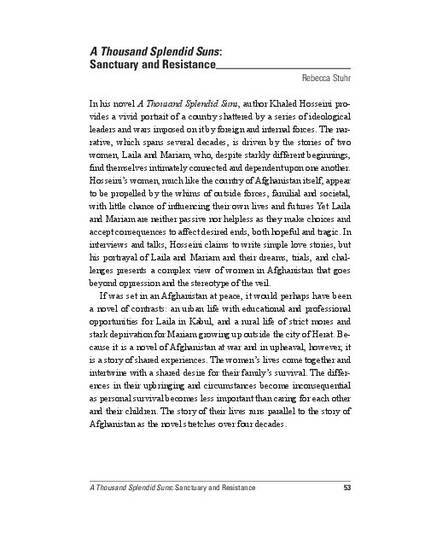 This chapter looks at Hosseini's second novel as a novel of resistance.